Rprofiler - Markers Alpha Released! 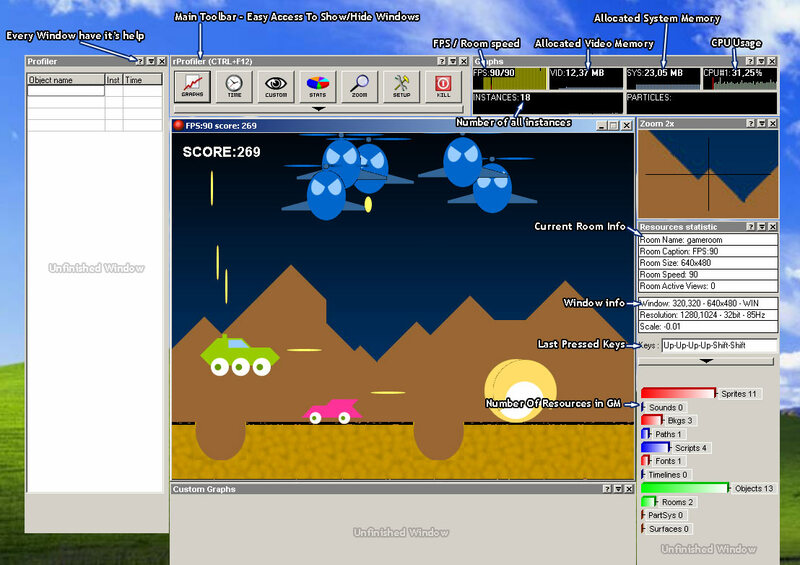 rProfiler is a tool in .dll, for REAL gamemaker developers. Unique way to measure speed of your game, and to have visual debug. and history, of most important game variables, and game speed changes. It have very customizable windows, to save space on your screen. Including rProfiler into your existing or new projects, will be just with by adding one .gml script or .gex inside your game. 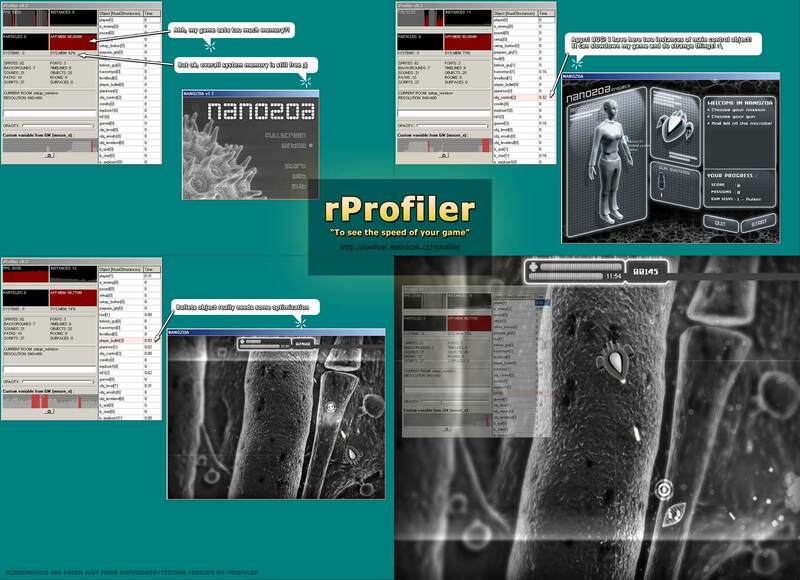 Visit rProfiler homepage for newest information. Edited by raist, 28 November 2008 - 11:14 AM. Looks nice but you should add an example. No one can use it now. EDIT: Sorry, I see that you are planning to add example files. But still, you should add an example from the beginning. Edited by h0bbel, 19 May 2007 - 01:11 PM. - Detects that the game is using too much memory, or too much particles/instances which are lagging the game, and either destroys them, asks the user what to od, or just ends the program? Because I hate when I'm designing something, and too many particles or instances get created, then it takes me an hour to kill the program without killing the power lol. Added detection of time which GM spent on every object! No, this isn't possible, the values are just product of bad code, sorry. Edited by raist, 28 November 2008 - 02:02 AM. 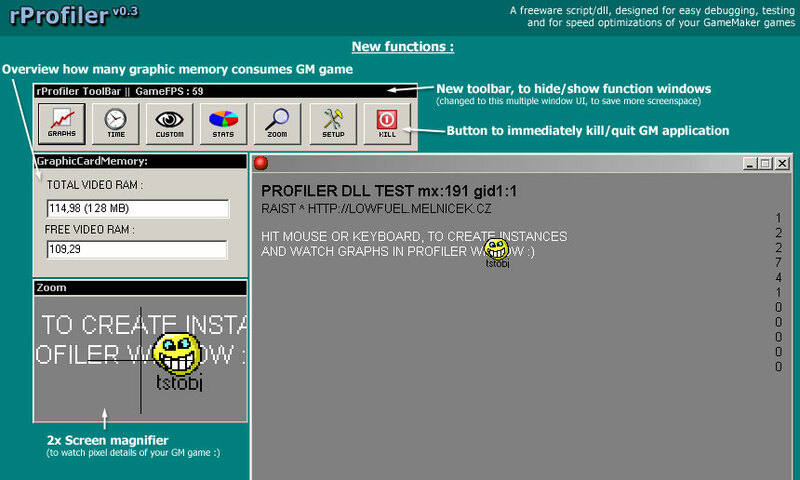 Very professional looking, might get better then GM's "debugger". besides screenshots, you could try a log file for reading later. 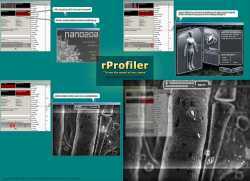 Watch profiler homepage for actual news. This would be perfect for testing a program I'm writing if you could check how much time a certain piece of code is taking, not just the time spent on an object. Since my program uses very few objects (currently, just 2), I would only be able to tell that either the controller or the ui of my program is slow, but not what part of it is the problem. If you could place in your own points to check the time between, that would be even more awesome than this already looks. Because of architecture of GM, and available GM functions, this will be hard to do. That's what I meant by placing your own points to check the time difference. Can't wait till this is finished! Edited by Zappix, 24 May 2007 - 11:15 PM. Enormous signature removed by moderator. READ and follow the Signature Rules, or your account may be closed. it would be nice if you only included dll, gm6, and gmk so we dont have to d/l 1.4 mb or however large it is. What programming language are you creating this in? I did a crash reporting feature dll (plus the GUI) in delphi, I could give you some key parts of the code if you want. yes, i want to release it as a .dll (max 400kb, but of course you will not include it in final release of your game) and as a GM extension. In delphi! So,it will be nice and useful for users, to improve it with you experience! Ok I'll help. It's still under test and may need some time to be complete. It's looking very nice, looking forward to it! This could be very powerful in combination with the default debug tool. I'm certainly going to use this once it's done. how exactly can it be used for speed optimization? by tracing memory leaks with this tool ! great work, great dll, this is definitly better then the built-in debugging tool! perhaps you can make an "execute an expression" function. that would really finish it. This looks VERY interesting. For me the best feature that will help me is to see how many ms did GM use on every object. Now I at least will now WHAT to optimize. Else, I optimize unneeded objects, thus making the game just a little faster. When will the new version will be released?? Else, you just update it but you don't give it to the users. Please, release it as it is now, and then just release new versions. aah, good idea, thanks ! Edited by raist, 18 June 2007 - 01:31 PM. Would be awsome, screenshots looks awsome! It's awsome. It's gonna be very helpful if someday it's gonna be released . The first serious tool I've ever seen. Won't be very useful to the typical GM user but nuts like me will love it. I suppose all interaction with the dll is passed through gml and the dll, so i can't actually attach it to a running gm exe, right? No, it isn't possible. I don't do any hacks to GM memory. So only solution will be, if you read and run any external .gml file from exe. yeah, it is for you! So I belive the system is completely dependent on window_handle()? I don't think you understood what raist meant. The game sends the data to the DLL which displays that data, and you cannot attach it to a GM executable. uuf6429: parts of rProfiler needs window_handle() to work (and it need to be updated often, because of gm changes it after some actions), but mostly it works as celebraces described. When the GM6 - GM7 files are gonna be available? This DLL is a great idea and seems to be progressing very well, but the current release isn't very useful without implementation scripts to go along with it. I really hope you get around to making them. It says file header damage and can't extract. When will this be released? It's looks great. so, maybe at end of August. Looking forward to this, it looks great. Â When will this be released? It's looks great. It's August 31, is it almost ready? My antivirus software (CA Etrust and Microsoft Live Onecare) says that the Rprofiler files contains the backdoor/trojan Win32.assasin?